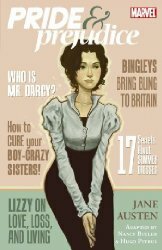 Laugh-out-loud comedy starring the delightfully playful sister to four other Bennet girls who takes a loving if lofty view of their crushes and gets each object of them wrong whilst failing to identify that she herself may also have fallen in love. Meanwhile her mother flusters about and her father occasionally looks up to undermine his dear wife with witheringly supercilious remarks that we really shouldn't find funny but do. Plus: cold Mr. Darcy is totally hot, and one of the many reasons that I'm jealous of Jonathan's middle name. If you cant précis Pride & Prejudice from memory then, really, what have you been reading all your life? Anyway, with due hindsight I can now confirm that Marvels version of EMMA is infinitely better, as is SENSE AND SENSIBILITY. I will add with additional hindsight, however, that these are mere illustrations of the novels, rather than intelligent and affecting interpretations to comics like David Hines and Mark Staffords THE MAN WHO LAUGHS and Mazzucchellis CITY OF GLASS; or Rob Davis uproarious propagation of Cervantes original intent in DON QUIXOTE VOL 1 and, best of all, DON QUXOTE VOL 2. Just so we all have terms of reference.